If you've ever wanted to use your iPhone camera as a video & audio input to stream using OBS Studio, we've got you covered. We've tried all the apps that let you do it over WiFi, but they're not fast enough, so we also allow you to use a wired USB connection. 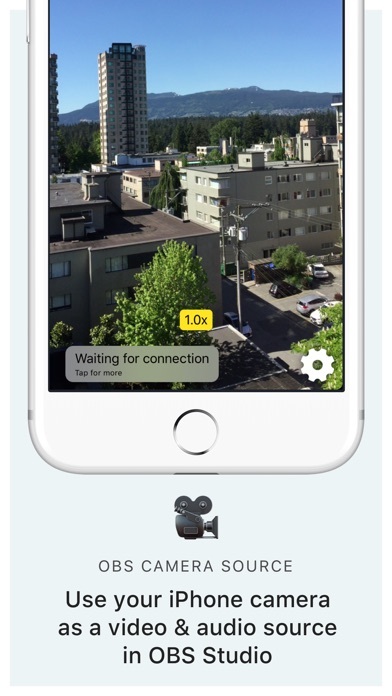 QUALITY VIDEO Your iPhone/iPad camera's are good, really good. In fact, there’s no comparison between the highly recommended streaming webcam, the Logitech C922 HD Pro and the iPhone 6 Camera. Stream Landscape or Portrait video. AUDIO If you don't have a separate mic for your streaming setup, you can now use the microphone on your iOS device to stream audio & video. FRONT CAMERA Stream a selfie with the front camera support. Switch anytime during the stream with the familiar camera switch button. 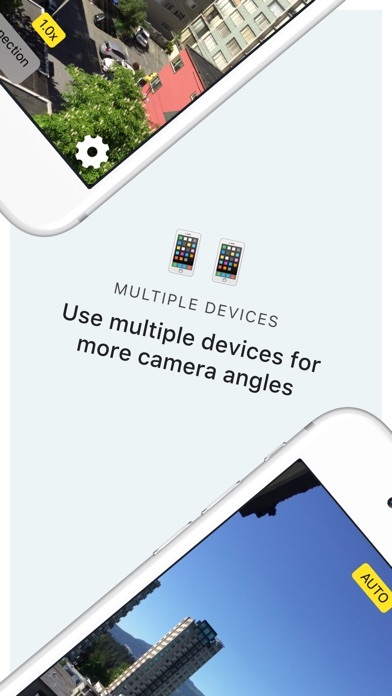 TAP TO FOCUS, PINCH TO ZOOM Controls just like you're used to from the Camera app. LOW LATENCY Stream video over a wired USB connection. This avoids the issue of delay over wifi, as many other solutions suffer from. This is just as fast as a USB webcam! USB & WIFI Choose the connection type. If you want low latency, use USB, if you'd like portability then use WiFi. WiFi is done using the NewTek™ NDI® protocol, so you can use Camera for OBS Studio with any NewTek™ NDI® compatible receiver. MULTIPLE DEVICES If you're lucky enough to own multiple iOS devices, use them together and produce a multi-camera stream. MAC AND PC Supports OBS Studio running on macOS and Windows. 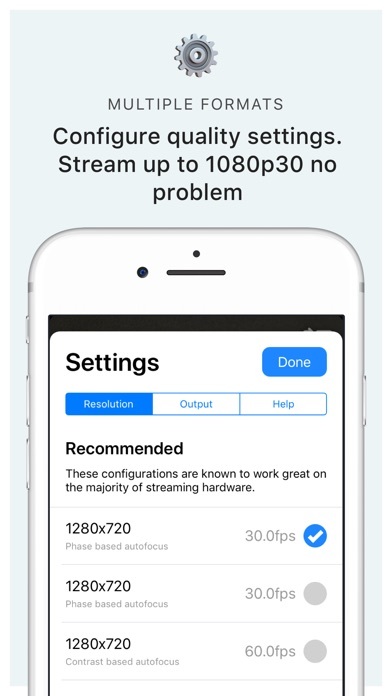 You will need to install the OBS Studio iOS Camera Plugin from our website, or use an NDI compatible receiver to use this app. Is there a way to make this work with streamlabs obs? I’ve sent two emails for Support with no response. 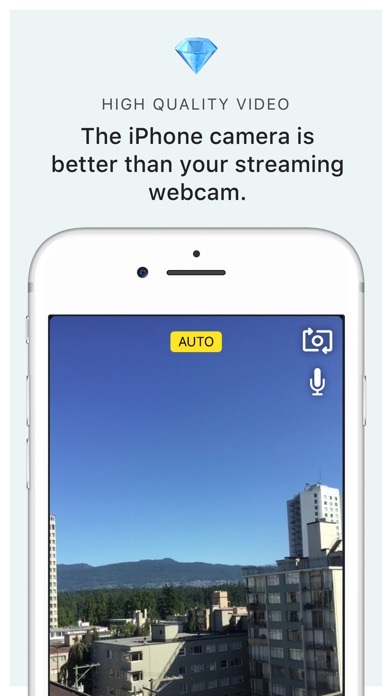 The app does not work and does NOT ever show the iPhone to use as webcam. This app doesn’t work. I have a new Mac book pro, new iPhone, and sent the developer an email. Initially he responded but when his response didn’t work... nothing else. I was hoping to use this and love it. I am pretty tech savvy so I was “sure” I would figure it out and others were missing updates or something else user dependent. Unfortunately that isn’t the case. This all is not compatible with usb type C which is what all macs are going to. I understand developing an app takes time but the lack of customer service is unreal. I’d love my money back but looks like I won’t be getting that either. Don’t waste your time or money. I’m not gonna lie I love this app! But not long ago I haven’t been able to use my phone’s camera on a new computer since all it’s USB ports are 3.0 and this app requires 2.0! It literally won’t work/connect at all! This is sooooo upsetting since I do enjoy completely this app! Please please fix this! Otherwise I’d give this 5 stars! This app works great. Worth it. It’s possible it worked for others but I was unable to connect to my device from my windows computer. I tried troubleshooting as the getting started page on obs suggested and didn’t have any luck. I’d like a refund but not sure if I can be bothered to jump through apples hoops. DO NOT BUY!! COMPLETE WASTE OF MONEY. If I could give it negative stars, I would. What an absolute waste of $16. The app may have worked at one point in its early stages BUT it DOES NOT work anymore. There is 0 support for this app. Also, it’s only supposed to work with OBS Studio. I wasted money, but above all - I wasted TIME (3 hours) trying to figure this trash app out. Don’t waste your time or money. This app needs to be removed from the Apple Store ASAP! I went through all the steps multiple times, I have iTunes connected and downloaded on my computer, I have the app downloaded on my phone, I have downloaded the plugin multiple times, but when I boot up obs, I still have no iOS option to add in sources. I tried the wireless connection as well as the usb and nothing will work. Don’t waste your money on an app that doesn’t stay up to date. Instead of spending $200 on a “good webcam” you can get a better one; from your phone. This app means everything to me. It works incredibly well via USB (because my internet can’t keep well with NDI+). If you’re a streamer, a YouTuber or whatever... get this app. I had an issue where the video feed would simply look broken. I contacted the creator and in less than a day I got a response. Thank you. Downloaded this app and it doesn’t work. Can’t get in touch to get a refund. Been trying for days. Absolutely ridiculous.